Life in Hawaii through the perspective of the plate lunch. The Plate Lunch as served by Honolulu Mark is a mixed plate metaphor for the way people, their stories and their food, come together on one plate to make Hawaii paradise. Honolulu Mark has returned home to his Hawaii roots but eats, shoots and leaves extend to my second home, Seattle. Hooray! 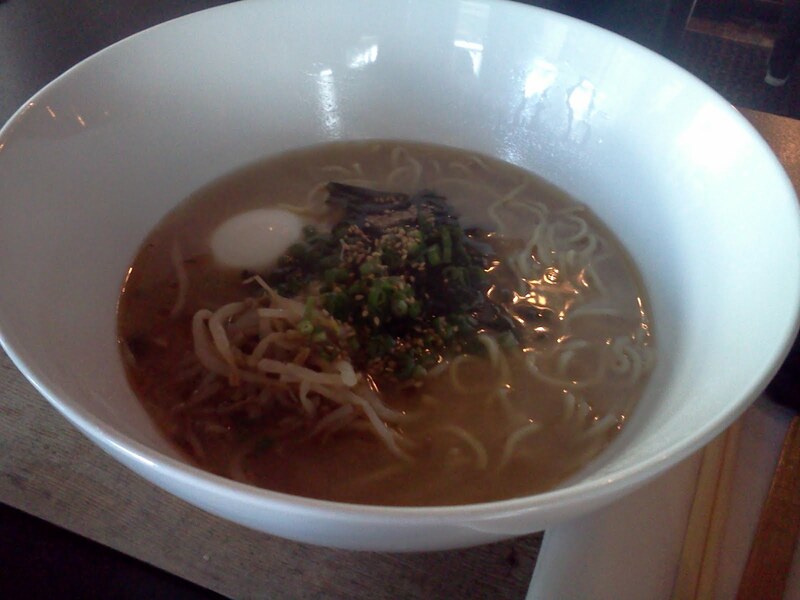 Finally there is a place in Chinatown that dishes out a good bowl of ramen. Located at 50 N. Hotel, on the corner of Smith and N. Hotel, Lucky Belly serves this bowl of noodles in a tonkotsu broth with a heaping helping of wakame. For a meaty bowl, try the one with pork belly and sausage. For a spicy kick, order the shrimp and kim chee. 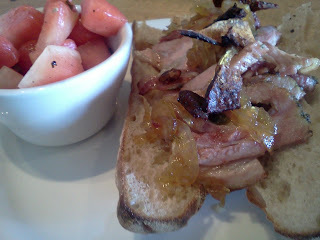 The guy sitting next to me at the counter enjoyed the braised short ribs with crusty baguette. Lucky Belly is a welcomed addition to downtown Honolulu. It rained one of those five to seven minute squalls at the Thursday evening Kailua Farmers Market. You know, one of those tempests in miniature whipped around by the trade wind breezes that provide a little relief to the sticky heat. But neither the rain nor the heat could keep me from the pho at the pop-up The Pig and the Lady. 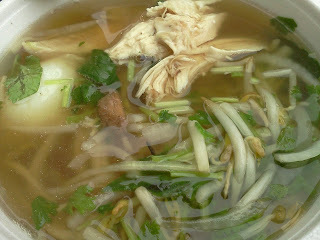 This week it was the chicken pho w/ the poached egg as seen in the photo above. As I dipped into the soup and noisily slurped up the rice noodles, here came the rain. But I just whipped out my windbreaker and @VH07V cap and kept right on eating. Meanwhile, the kitchen crew quickly erected a tarp canopy to keep the table covered. Such are the risks of dining al fresco. Risks, however, well worth taking when it comes to the delectable dishes at @pigandthelady. I hope I spelled the name of the soup in the photo phonetically correct. It's a Vietnamese veggie tofu soup from the family Le aka @pigandthelady - The Pig & The Lady - that is my favorite stand at the Kailua Farmers Market. 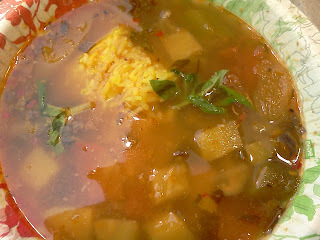 Tamarind, tomato and pinepple come together in a tart, sweet, light soup perfect for warm summer nights in Hawaii. Da kine local Hawaii greens meets Alaska salmon in this salad photo. Found a nice piece of Alaska Seafood hot-smoked salmon at the grocer yesterday. The skin on the fillet sliced off easily. I fried it crisp for bits and tore the fillet into pieces by hand. 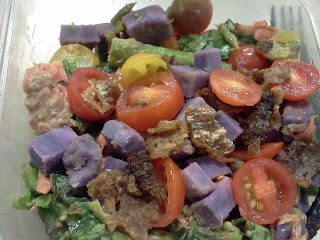 There's local purple potato, Ho Farms tomatoes, Wailua asparagus, Nalo Farms fresh basil, mint in there as well. 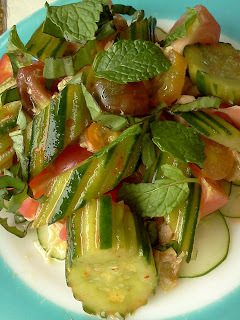 Local grown cucumber, mint and tomatoes came together nicely for a tuna salad I made for lunch today. Got these fresh strawberries from grocery last week. 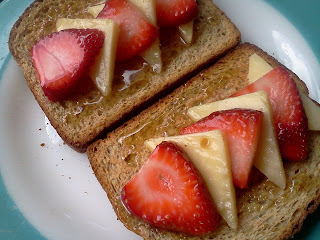 They came from Kula, Maui, and they really like to be with Gouda cheese and Ohia Lehua honey. The honey comes from Nalo Meli, found at the Honolulu Farmers Markets. The Kakaako neighborhood of downtown Honolulu has recently shown sparks of energy, an urban vibe that's exciting to experience. The Whole Ox Deli (327 Keawe St.) is a part of that vibe. It's a destination. It's the kind of place that you tell friends and colleagues they have got to try. This savory roast pork and cracklins topped with sweet fennel is one of the reasons why. The salad of watermelon, tomatoes and mint, is a great complement.